HVAC ductwork issues can go unnoticed for a long time, but the efficiency of this air delivery system directly influences the performance of a home's air conditioner, central heater or heat pump. A home's HVAC may be losing as much as 30 percent of its conditioned air as a result of faulty or leaky ducts. The HVAC system contains of a long, branching group of duct pipes that snake throughout a house, hidden behind walls, ceilings and floors, or in the attic, crawlspace or garage. Because the majority of this system is hidden, house owners can have a hard time visually assessing ductwork's condition. Further, even if the ducts were installed correctly, over time connections can loosen or ducts can incur damage. * Uninsulated ducts - When a portion of the ductwork system travels through areas that do not have access to cooled or heated air, like an attic or garage, cool air moving through the ducts will succumb to the hotter attic air surrounding the duct pipes, a process called conduction. In the winter, heated air can cool off for the same reason. This ductwork problem, however, is easily remedied by insulating ducts. * Damaged ducts - A variety of factors can lead to damaged ducts, such as connections breaking loose, human interference or poor installation methods. No matter the cause, if conditioned air leaks out of the ducts, the house owner will pay for it in terms of higher energy costs because of reduced efficiency of the HVAC system. Sealing ducts can remedy leaks, but seriously damaged ducts may require that the house owner replace a portion of the HVAC system's ductwork. 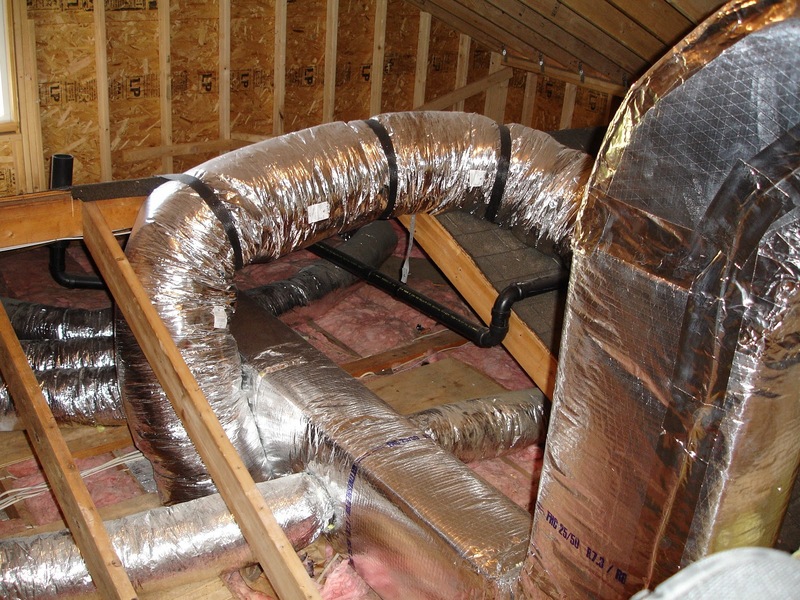 * Poor duct returns - A healthy, efficient ductwork system relies on a balanced supply of air sent into the house, along with a healthy amount of return air that moves back into the HVAC equipment. The return air portion of ductwork is particularly prone to problems such as a lack of adequate return grilles, and the HVAC system is prone to leakage too. Proper inspection will identify the root of ductwork problems. There must be an equal amount of return air to support the supply air ducts. For every 1 ton of a/c capacity there must be 400 cubic feet per minute of air volume available in both return air duct and supply air. So for example, a three ton a/c systems will need 1200 CFM of duct duct work in both supply and return air ducts. For house owners experiencing hot or cold spots and restrictive air flow in their house should contact an HVAC qualified professional. They will perform a comprehensive ductwork inspection in the house, and will make any recommendations to improve the house owner's HVAC service. Having your ducts cleaned regularly will help you avoid expensive problems, increase the operating efficiency of your system, and improve the indoor air quality in your home. HVAC plays an important role in the designing and construction of huge industrial and office buildings. It proves to be of immense use in building skyscrapers and marine environments such as aquariums. HVAC checks the safety conditions of huge structures and helps in regulating the temperature and humidity level of the buildings with the use of fresh air from outdoors. I unfortunately was not familiar with the regular maintenance that I could have been doing to save me money on hvac repair down the road. Thank you for sharing this with your readers! Thank you so much for this insightful post! My HVAC system hasn't been working as well as it should be. I actually just called my HVAC contractor for maintenance. It sounds like it may be an issue with the ducts like you described in your post. I will have to mention that to him.